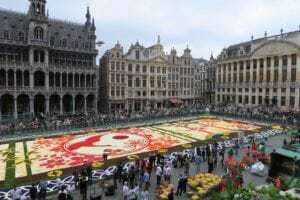 When’s the last time you saw 600,000 begonias arranged over 19,000 square feet to form an intricate design celebrating some unique aspect of Belgian culture? 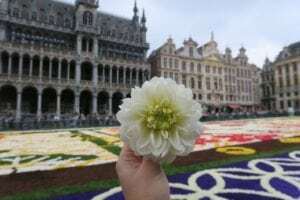 If your answer is “never,” block off a week in an even-year August to rectify that, because the biennial Flower Carpet in Brussels, Belgium, is a sight to be seen. 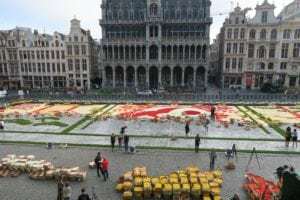 This four-day spectacle is an extraordinary production, with hundreds of volunteers gathering in the wee hours of the morning to lay hundreds of thousands of flowers across the gigantic expanse of Grand Place. A vibrant light and music show rounds out the opening day, and similar festivities take place each of the following nights. 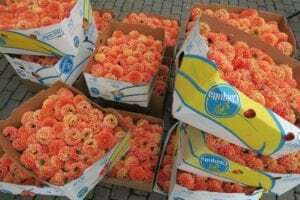 Boxes and boxes of flowers–mostly begonias, but other varieties too–went into the making of the 2016 Flower Carpet. 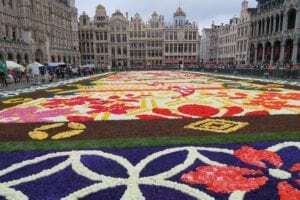 Every year, the Flower Carpet design is inspired by a purposefully chosen theme honoring some aspect of Belgian culture or history. In 2016, the Flower Carpet’s richly symbolic pattern aimed to celebrate 150 years of friendship between Japan and Belgium. Stunning incorporation of Japanese symbolism in the heart of Belgium. Visitors come from all over the world to marvel at the unique beauty of this floral extravaganza. With the scent of street waffles and Belgian chocolates floating through the air, Grand Place–especially when outfitted with its dazzling array of flora–is a feast for the senses. My souvenir from behind the scenes of the 2016 Flower Carpet (taken from one of the many boxes of leftovers, of course!). For an up-close look at the assembly and premiere of the 2016 Flower Carpet, check out my Facebook Live feed providing coverage of the day’s activities and exclusive interviews with Flower Carpet VIPs. Panoramic view from the balcony of Town Hall. Definitely worth the 5 Euros. Wondering where to stay if you plan to make the trek to the next Flower Carpet? I recommend this hotel if you want to be in the middle of the action. Hi Skye, lovely blog about Brussels! I visited this city twice, but I never saw the beautiful flower carpet. The pictures look amazing and you are so pretty. Since I live in Holland I should definitely come back to visit this event. Are you back home in the US or travelling around? Thanks, Kasia! I really appreciate your kind words! The Flower Carpet only happens for a few days every two years, so it’s easy to miss. I’d definitely recommend adding the next one to your calendar–though it won’t be until 2018! We are traveling around for a bit. I’m not sure when we’ll be back to the US! Right now, we’re in Barcelona and loving it.